Contrary to its name the German Shorthaired Pointer is an all-around gundog, not just a pointer. It is capable of pointing, trailing game, flushing and retrieving from both land and water. 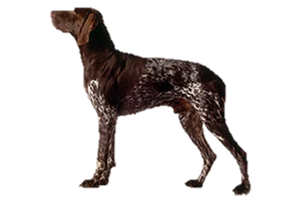 The German Shorthaired Pointer originates in Germany and is closely related to the other German Pointers, the Longhaired, Wirehaired and Rough Haired. It is believed they were created in the 17th century by crossing the old Spanish Pointer and early German gundogs. This cross made a slow, heavy dog, which was crossed again in the 19th century with the Pointer to finish establishing the dog we know today. Is the German Shorthaired Pointer Right for You?